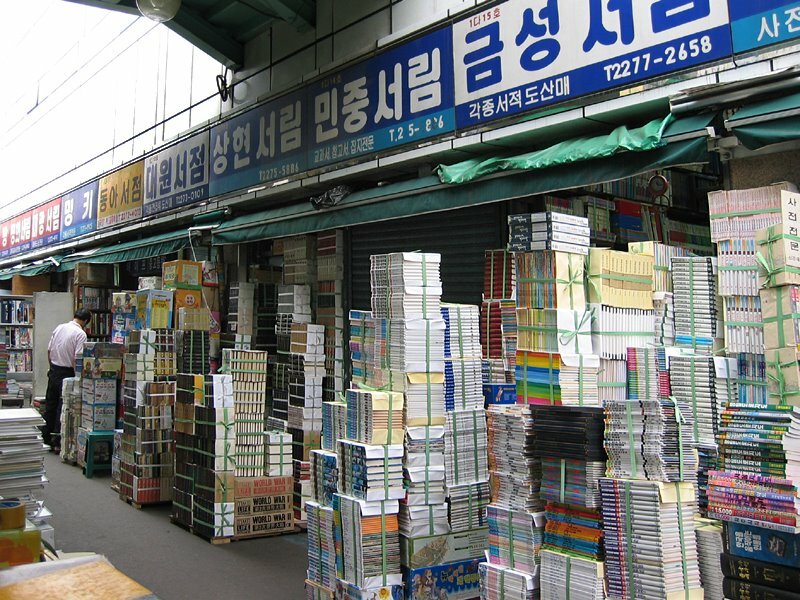 After a visit to the Book Fair in Helsinki, let it be noted that Hankyoreh has been running a sympathetic series on second hand bookshops (hônch'aekpang). The latest is titled "Throwing away 'cultural rubbish' and putting only good and selling books". The books that the shopkeeper throws away are included in what he buys from used books wholesalers; the books apparently come in heaps which the retailer cannot see beforehand. Our visit to the Book Fair in Helsinki; the miser that I am, the publishers' displays did not raise my interest, but luckily the second-hand retailers were present in great number, and browsing the bookshelves in those places we spent several hours. Not sure if the prices had been rised for the fair or if the participants were of the more expensive kind of shops. The Korean word, paejjang changsa is fitting for the situation in which several bookshops were asking 25-30 euros for the older print of a book published in 1993 which is available as a 2nd print for 19.90€ in the largest Helsinki bookshop. "Second-hand"; In my '99 visit to Shanghai I saw the word 二手 in some retail establishments. It was quite evident what the term ("two" and "hand") stood for, even though it was a bit perplexing that the Chinese would be using such a translated loanword. Could it have come via Hong Kong, where the photo to the right is from? 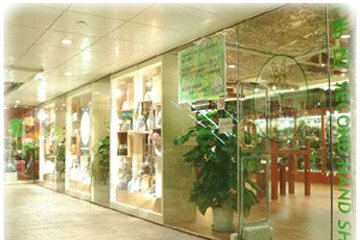 Daily NK has a Yonhap article (which quotes the Chongryeon, DPRK affiliated association of Koreans in Japan, newspaper Choson Shinbo) on the increasing commercialization of neighborhood hairdressing shops (tongne miyongwôn) in North Korea. Hairdressers are responding to the increasingly sophisticated demands of the clientele and competing with the few large establishments available in Pyongyang. 27일 재일본 조선인총연합회 기관지 조선신보 인터넷판에 따르면 대동교 미용원은 최근 많은 자금을 투자해 얼굴 마사지 설비 세트를 갖춘 ’미안실’ 등을 새로 만들고 다양한 서비스를 병행하고 있다. ’현대적인 미’를 추구하는 주민들의 욕구가 갈수록 높아지고 있는 데다 ’겉보기가 속보기’라고 현대적인 시설과 서비스를 갖춰야만 고객을 더 많이 끌어들일 수 있다는 판단에 따른 것. 사실 북한에서 파마나 얼굴 마사지용 고급 시설을 갖춘 미용원은 창광원과 문수원 등 일부 대형 대중 목욕탕에 불과했다. 동네 미용원의 시설은 낡고 서비스 또한 형편 없었으며 얼굴 마사지 같은 것은 꿈도 못꿨다. 이 때문에 멋을 내기 좋아하는 여성들은 동네 미용원을 아예 이용하지 않으려 했고 창광원 같은 대형 시설을 선호했다. 당연히 동네 미용원에는 손님이 없는 반면 대형 미용원에는 반나절을 기다려야 겨우 이용할 수 있을 정도로 극심한 대조를 이뤘지만 ’골고루 분배’로 별 손해는 없었다. 그러나 7.1경제관리개선 조치로 ’일한 만큼 번다’는 인센티브 제도가 확실하게 자리매김하면서 상황은 달라졌다. 결국 대동교 미용원은 고객수를 늘리기 위해 얼굴 마사지를 위한 증기미안기, 증기소독기, 자외선 및 적외선 소독기, 얼굴 마찰기, 기름 흡착기 등의 설비를 구입한 것이다. 특히 금방 목욕을 하지 않은 상태에서 미용원에 들렸거나 얼굴 피부 구멍이 잘 열리지 않는 고객들이 이용할 수 있는 ’미안 보온실’을 별도로 만들고 여성들의 편의를 도모해 주고 있다. It is possible to do things with words, like for example get higher value for real estate by attaching another place name in it. Residents in certain areas in Seongnam, Bundang, and Yongin in Gyeonggi-do have been making pleas to authorities to have administrative districts redrawn so that their are would be included in a highly valued dong (洞). (Seoul Sinmun article in Media Daum.) We see the same in Finland as well, when the real estate marketers use their imagination in redrawing and even renaming districts. Another correction (rectification) of terms, this time anticipating reforms and redesigns, is the plan to change the word for "barracks" from naemuban to saenghwalgwan, which is included in the military reform draft made by the government and the governing party. The material basis for the renaming would be the increase of the size of the barrack rooms (are they called that?) from 0.8 pyeong (2.6 sq.m) to 2 pyeong (6.6 sq.m) per soldier. For conscripts, that doesn't sound so bad, and would be definitely more than their Finnish colleagues are able to enjoy. (For barracks over here, see this, this, this, and the linked picture on the right.) Instead of sleeping on elevated platforms (or whatever they can be called), each conscript will be provided with a separate bed and a small table. (A table! What do they do there?) The renamers also say that naemuban has been a war-time space to stay only a short time before moving on, but this will reflect the change of such facilities to places of living (saenghwalhanûn konggan). I don't really know how such terms are sensed by native speakers, especially those who've done their conscript service. Naemu (內務) in naemuban, "inside affairs" is the same as in Naemubu, Ministry of Interior. Perhaps the connotation of a separation and deviation from the normal society is too big - like the minister says, the aim is to make "an army that people want to go to" - and saenghwalgwan definitely sounds more civilian. It is not mentioned here, but the recent case of a mass killing by a conscript in the barracks he was serving quite likely looms behind this whole project. It is still easy to be sceptical about the conscripts of feeling of having no life (saengghwal) despite of living in a saengghwalgwan. Being a conscript in a total institution like armed forces cannot but be such a physically, psychologically, also culturally separated and different experience. IIAS Newsletter: "War and the colonial legacy in recent South Korean scholarship"
Enlightening article in the most recent IIAS Newsletter by Kyu Hyun Kim, assoc. prof. of Japanese history U. of California: War and the colonial legacy in recent South Korean scholarship, in which he introduces some of the not-yet-mainstream Korean "post-nationalistic" (?) scholarship on Japanese colonialism in Korea. 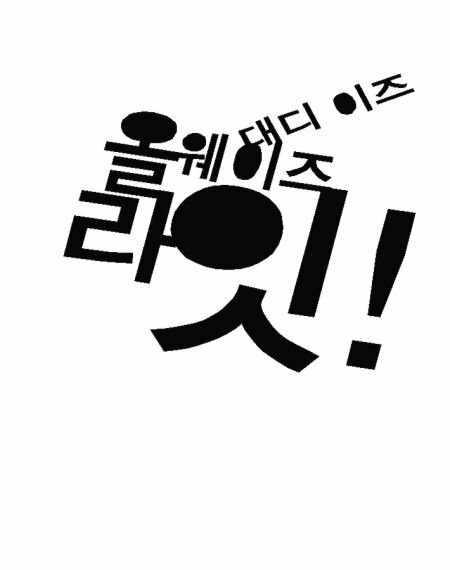 The scholars and their work introduced are Im Chi-hyôn, Minjokchuûinûn panyôgida (Nationalism is Treason) (Seoul: Sonamu, 1999), Sin Hyông-gi, Minjok iyagirûl nômôsô (Beyond the story of the nation) (Seoul: Sam’in, 2003), and Yun Hae-dong: Singminjiûi hoesaek chidae (Grey zone of colonialism) (Seoul: Yŏksa Pip’yŏngsa, 2003). Im Chi-hyôn, Sin Hyông-gi and Yun Hae-dong’s works reflect a new type of scholarship in Korean studies, still in the minority, but growing in importance, which tackle the difficulties and problems of accessing memory of the colonial period. Critical of the ‘nationalist’ perspective that, in its extreme but by no means atypical form, has cast the colonial-period experience as a shameful legacy to be discarded from the master narrative of Korean ethnos/nation, these scholars have found anti-colonial nationalism to be ‘implicated’ in post-1945 North and South Korea’s war mobilization programs, which have ironically shared important features with those implemented by the wartime Japanese government. These works suggest that both unreflective rejection of the colonial legacy in its entirety and whitewashing of the collaboration and wartime mobilization among colonized Koreans are inadequate for initiating the process of exploring postcolonial Korean identity. Together with honest and thorough re-examination by Japanese, Chinese and other East Asian scholars of the colonial experiences and wartime legacies of their respective peoples ­ as colonizers and colonized, aggressors and victims, ‘collaborators’ and resisters - we can hope, in the very near future, to encounter many challenging and illuminating works of scholarship on Korea between 1937 and 1945. • Review by Kim Seong-jae of Im's book "Nationalism is Treason" (민족은 반역이다) in which is I guess the Chosun University (Gwangju) newspaper. It's important to know that the concept for "people" or the subject for whom the nationalism should be reformulated is minjung. That does not sound very original yet, stating that instead of the use of nationalism (minjokchuûi) by the rulers in their ideologies, it should be put into use for the "masses." (I've always thought that the appropriation of the concept minjung on someone presupposes that there is a "proper" awareness of minjok and minjokchuûi.) The book in Aladdin Bookshop. Ohmynews article conveys the piece of news from the Chinese Xinhua news agency that the PRC government will start using "Shouer" (首尔/首爾) for Seoul, as promulgated by Seoul last January, and discard the old "Hancheng" (汉城/漢城). I couldn't (didn't have the skills to) locate the article that is being referred to, but according to Ohmy a Xinhua reporter had gotten a confirmation from the concerned government organ that China will change Chinese name for Seoul from 汉城 to 首尔. Xinhua also quoted a specialist saying that naming Seoul as "Shouer" (首尔) conforms both with the international practice and the Chinese practice of rendering foreign place names. About the success of the Korean-led change of the Chinese name of Seoul, there were reports already soon after the promulgation of 首尔 that it would have gained some ground in the Chinese media (Ohmynews article on Feb 27, 2005). Could it be that the use of 首尔 would have meanwhile become widespread enough to alleviate the change of the official Chinese practice? From googling 首尔 韩国 I see for example that the Seoul National University is written as 国立首尔大学. To be updated when more info is available. • 中国将启用汉城市中文新译名"首尔"; even though my ki (氣) is six feet below the ground when confronted with the hanmun (漢文) prowess of my blogger colleague Sanchon Hunjang, I'm still able to figure out from the title and the text that China is about to officially recognize 首尔 as the Chinese name of the South Korean capital. Other reports in the Chinese media only seem to use the Xinhua piece (like this one: 韩国首都中文译名改为“首尔”). A couple of things about the Korean War I thought I'd just write up. • Mauno Koivisto (b. '23), social democrat and president in 1982-1994, wrote in his memoirs that he was hesitant of having a family in the insecure world at the turn of the 1950s when communism seemed to be taking over the world, but the Western resolve in stopping the invasion in Korea gave him courage to marry. In the late 1940s Koivisto had been active in the anti-communist activity of social democrats. 며칠 전에 공항 국경공비원들한테 전화가 왔다. 자신을 소개하자마자 무슨 일로 연락을 했는지 알았다. 그런데 이번엔 통역이 필요한 손님들이 이남에서 온 것은 아니었다. 경비원은 북과 남은 말이 똑같으냐고 확인하길래 내가 정치와 사투리사이만 빼고 같다고 했다. 그런데 통역을 하다 보니까 내가 한 그 말이 나로서는 결국 맞는지 의문이 생겼다. "제가 말을 남쪽에서 배웠으니까 천천히 말씀하시길 바랍니다"라고 해야 했었다. 다행히 말이 결국 충분히 통하긴 통했고 경비원들이 하고자 하는 말을 정확히 전할 수 있었다. 김정일이 2000년 남북 정상회담에서 김대중의 말에서 80%밖에 이해 못 했다고 한다는 것을 보면 내가 그렇게 못 한 건 아니겠지? 남쪽 사람도 아닌데 말이야. The difference to many Western nations is that the motive to pay wages are not the benefits that wage employment brings (increased pension, sick leave). Also in Hankyoreh, in an editorial criticizing the Hannara (Grand National) Party's proposal for tax cuts, there are a few bits of noteworthy information. Half of the workers (nodongja) and self-empoyed (chayôngôpcha) do not pay any income tax. Basis for Hankyoreh's criticism is that in such a situation the benefits of the tax cuts would go to earners of high wages and big companies, leaving the ordinary people (sômin/seomin) on the cold. They'd still be paying their share of the indirect taxes. Hankyoreh makes a good point, especially as the image of the government party (Our Open) has been less seomin-friendly than that of the opposition. See also the English translation of the editorial. The GNP's tax cut is clearly something for those of high income and a minority of conglomerates. Half of all laborers and self-employed persons pay no income tax. Reducing income tax largely benefits people in the high-income bracket, more so than the common people. 221 conglomerates with big earnings pay for 62 percent of the country's corporation tax, so if the tax rate on that is lowered it mostly benefits a minority of conglomerates. It is deception on the part of the GNP to say it wants this tax cut so as to "reduce the tax burden for the common people" when the common people would enjoy few benefits. The latest addition to the debates is provided by Chang Si-gi of Dongguk University, who writes from his sabbatical leave in South Africa under the title "Kim Il-sung is a Great Modern Leader" (Yonhap article in Hankyoreh) that Africans (talk about generalizing) feel more affinity with North Korea than South Korea and regard Kim Il-sung as a great modern leader (widaehan kûndaejôk chidoja), but he handily continues the use of those epiteths on the late Kim even after he doesn't talk about Africans any more, letting us understand that Kim the father was a great national leader at the time when such leaders were needed (as in the natinonal struggle against the USA). According to Mr Chang, what is now needed in Korea is a leader who makes the future, and is a internationalist leader building on Koreanism (hanbandojuûi) and Asianism (asiajuûi). But doesn't Mr Chang forget that Kim Il-sung was already all that? By the way, on what does Mr Chang base his claim that North Korea is more favored than South Korea among Africans, other than his talks in South Africa? I understand that DPRK was very active in the African nations at the time it could afford to (so that the two Koreas were very busy opening embassies exceeding the actual diplomatic needs), but shouldn't "the Africans" be a bit more aware of the goings of the world that Mr Chang lets us know? But it is true that many African nations still have a true friend in the North, even if the assistance is more in the form of congratulatory messages than in concrete things. This time the president of the Equatorial Guinea has received a message of congratulation for the 37th anniversary of its independence. And let's not forget also that National Society of Juche Studies in Kongo among other like-minded organs in other countries has held all kinds of celebrations at the eve of the 60th anniversary of the Korean Labor Party. Aaron notes in the comments that the asiajuûi used by Chang Si-gi recalls the "Pan-Asianism" of the Japanese empire in the late 19th and early 20th century. Ironically, that ideology was also used to colonize of Korea, but Chang seems to have missed these connections. (Talk about "cleansing" the vestiges of Japanese colonialism...) What makes such ideology (or the use of such terminology), once used for imperialist goals against Korea, compelling is its Anti-Western nature. Marmot provides links and quotes to the reply by the Seoul embassy of South Africa to Mr Chang's views. The embassy denies Mr Chang's points concerning South Africa as "totally distorted from reality." Marmot also links to and quotes accounts of what the DPRK support in more concrete in its more concrete manifestations. I know that shopkeepers can take a shot of soju every now and then, quite often actually, but the fact that they have no-one to do their work for them seems to curtail excessive drinking. Which makes me think that this survey was meant to be an ad for the hospital, as it coincided with the first anniversary of the foundation of the place. Got a phone call from the broadcasting station; lately I've been refusing their requests for small translation jobs since the money they'd pay would just make me sad, and they don't take offers, so I was prepared to say that I'm sorry but I'm not available. But it was about movies, and they are a bit different, even though the pay doesn't add to much. As I heard the names of the totals seven movies to be broadcasted next spring in the digital "culture" channel (which is available only for those with a digital receiver, excluding me among others), I did not become too encouraged by the task ahead: all are by Kim Ki-duk, from Agô (Crocodile) to Samaritan. Moneywise, no good because there's so little dialogue and the fee is paid according to the number of lines. Mentally, seeing all the Kim's misogynism will not be pleasant, and I only hope there's no dialogue in the "fishing hook scene" of The Isle so that I don't need to watch it through and through. 하하, 영화중에 하나인 은 벌써 몇년전쯤 다른 채널에서 내 번역으로 방송된 적이 있다. 그래서 내가 번역도 다 갖고 있는데, 이번에 전화한 방송관계자한테 그말을 할뻔 했다. 불이익을 먹었는지 모르겠지만 그냥 가만히 다 번역하는 척하는 게 나을 걸. 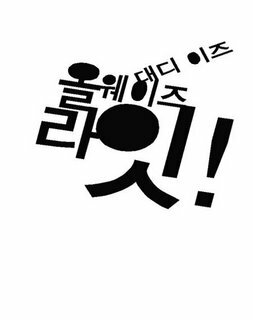 그렇게 번역료도 작게 주는데. "여러분 안녕하십니까? 잠시 양해의 말씀을 구하겠습니다. 스텐실 워크샵 홍보부 대표이사 안띠 렙배넨이라고 합니다. 저희 제품에 대해서 잠깐 관심을 보여 주시길 바랍니다. 한글 아시지요? 세종 대왕께서 창조하신 한민족의 정신을 담긴 고유의 글자입니다. [티셔츠를 보여주면서] 요새 이러한 한글로 된 티셔츠가 세계에서 큰 인기를 누리고 있습니다. 파리, 런던, 밀라노 같은 세계적인 선진국 백화점에서 명품 중에 명품이랍니다. 이번에만 여러분께 특별 할인 가격으로 드리겠습니다. 백화점에서 만원인데, 여러분들께 한 벌 5천원, 3벌 만원으로 드립니다. 기회를 놓치지 마세요. 저희 스텐실 워크샵의 한글 티셔츠를 입으시면 서양 선진국처럼 세련되게 보이실 겁니다. ... 자, 여기 보십시오. 네, 고맙습니다. 예, 여기 있습니다. 잠깐만요... 네, 만원 받았습니다." 기아바이로 나가는 용기는 실제 있었을까? 글쎄..
기아바이들의 현실에 대해서 신동아 ([르포] 지하철 행상의 세계), 오마이뉴스 (지하철 차내에서 행상을 만나다), 조선일보(현장르포-기아바이의 하루)에서 읽을 수 있다. I've presented here also in earlier occasions paintings by a person who goes by the name Jeongjikseong (정직성) in Flying Net, but whose real name is available in an introduction of an art exhibition. 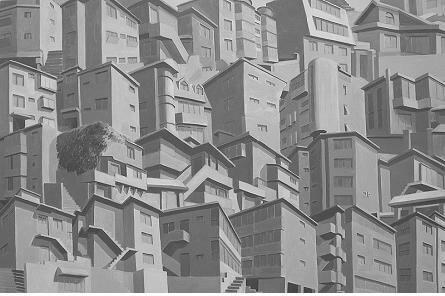 She (as I surmise from the name) has painted several pieces expressing the complexity and multiplicity of the urban Seoul, especially in the case of areas of small housing (chut'aek) like my own dear Sillim-dong (where she also apparently lives). Jeongjikseong has written an introduction to her urban house painting for Flying Net, from which I dare to link also this picture. She also has a personal blog and and an art blog. 이 그림은 제가 살고 있는 신림동을 그린 그림입니다. 특히 ‘연립주택'이라는 구조물에 주목한 것은, 건축법의 영향을 받아 크게 보아서는 비슷비슷한 형태이기는 하지만 거주자에 의해 다양한 형식으로 변형되는 서울의 연립구조의 특수성 때문이었죠. 광범위한 지역을 한 건축회사의 설계로 시공하는 아파트와는 달리 연립주택의 경우 건축법을 건축주가 어떻게 해석하느냐에 따라 구조가 기묘하게 변형되기도 하고, 살면서 거주자가 덧댄 가구조물들로 인해 건물이 스스로 성장 하는듯한 느낌을 주기 때문입니다. 이러한 구조의 자율생장성은 법이나 제도의 망으로 포획되지 않는 서울의 초월성을 드러내는 한 단면이기도 합니다. 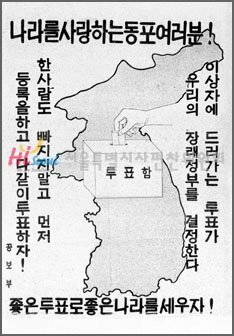 The picture: poster for the Southern elections in May 1948 encouraging to vote.